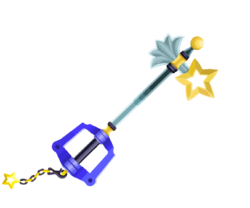 "A Keyblade that survives from antiquity." 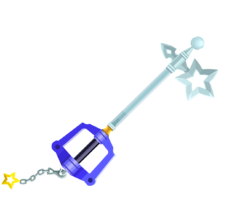 Defeat the Demon Tide in the Keyblade Graveyard; DLC code from Kingdom Hearts Union χ. 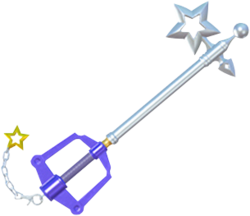 The Starlight is the default form of Player's Keyblade in Kingdom Hearts χ and a Keychain for Sora's Keyblade in Kingdom Hearts III. Its base form is also wielded by the members of the Unions, while its third upgrade is wielded by Ephemer, Skuld, and Strelitzia. 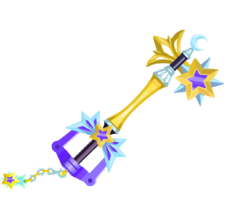 The first upgrade adds a gradient to the Keyblade's shaft, making it darker closer to the tip, and joins to the rainguard with a black segmentation. The star at the teeth is now gold, and the spike opposite has been replaced by a fanning trail that invokes the image of a shooting star; the section of the shaft where the trail passes through is now gold. The links of the Keychain are now alternating black and gold, with the clip being black. The second upgrade changes the entire shaft to gold, save for the segment where the teeth pass through, which is black. The star's trail is also gold, and the orb at the end now bears two circling rings in an X formation. The rainguard is now black, with a white segmentation to join it to the shaft. The guard has been made a lighter blue, and the Keychain's token now possesses a shooting star trail. 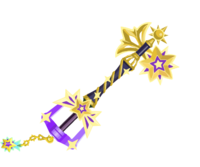 The third upgrade drastically changes the figure of the Keyblade. The shaft now has an hourglass arc, joining to the now-wider rainguard with a silver segmentation and the teeth with a silver cage shape; the orb at the end of the shaft has been replaced by a crescent moon. The gold star at the teeth of the key is now overlaid upon a blue five-pointed star, producing a ten-pointed star, and the trail is now wider and hollow. The guard now bears a gold star filled with blue at the hilt, with silver and blue shooting star trails in either direction. The Keychain is now alternating links of silver and gold, with the clip being silver, and the token is now filled in with blue. 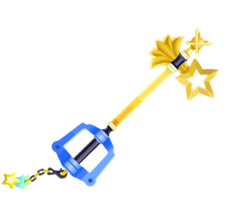 The fourth upgrade turns the shaft black, and adds a gold spiral along it with three four-pointed stars of pale gold. The segmentation at the rainguard and the cage near the teeth are both gold, and the crescent moon has been replaced by a golden sun with seven ray points. The star at the teeth is now three layers of gold, blue, and pale gold, and the trail is slightly wider. The shooting star at the hilt is also three-layered in the same manner as the teeth, with the trails now gold and blue, and a four-pointed star like those on the shaft are added to the opposite corners of the guard. The token is now a ten-pointed star in the same manner as the teeth, gold overlaid upon blue. 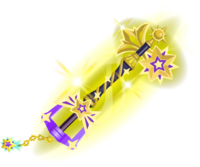 The fifth upgrade gives the Keyblade a powerful, swirling golden aura. The Keyblade's name reflect the stars involved in its design and is also associated with the force of light.